Steven (Chicagoland, United States) on 8 March 2017 in Cityscape & Urban and Portfolio. 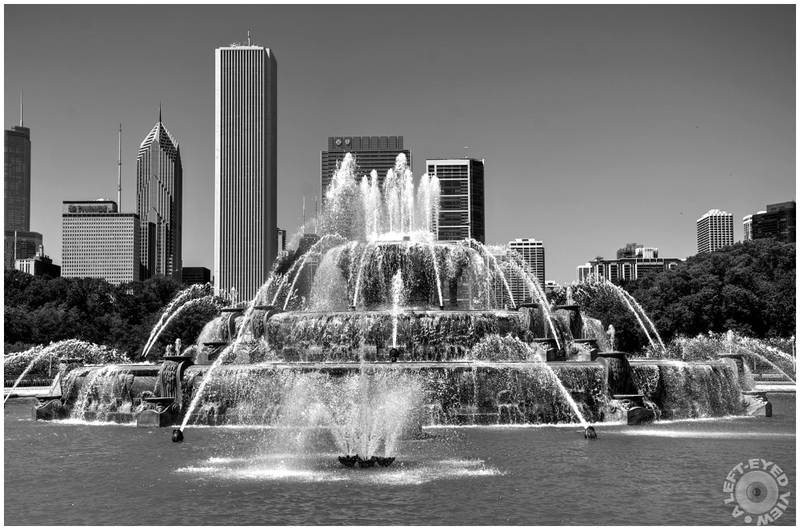 The fountain is considered to be Chicago's front door, since it resides in Grant Park, the city's front yard. The fountain, located at Columbus Drive and Congress Parkway, was designed with sculptures by Jacques Lambert. It was donated to the city by Kate Buckingham in memory of her brother, Clarence Buckingham. The fountain itself represents Lake Michigan, while each sea horse symbolizes a state bordering the lake. The statues were created by the French sculptor Marcel F. Loyau. The design of the fountain was based on the Bassin de Latome and modeled after Latona Fountain at Versailles. The fountain runs from 8:00 AM to 11:00 PM every day from mid-April to mid-October. During a water display that runs for 20 minutes every hour on the hour, the center jet shoots up vertically to 150 feet. At dusk, a light and music show coincides with the water display. The last show of the night begins at 10:00 PM. The fountain contains 1,500,000 U.S. gallons of water. During a display, more than 14,000 U.S. gallons per minute are pushed through its 193 jets. Buckingham Fountain was dedicated on August 26, 1927. Photo captured July 20, 2012. Great country in a big city everything is great. Stunning view. Excellent. Toujours aussi bien cadré. Very nice landscape. Ok with the b/w. un superbe cadrage dans ce beau cliché Steven..
Love the black and white. I saw this fountain way back in 1977(?). A friend from Racine took me to Chicago. Oui, c'est vrai on pense à Versailles... Elle est somptueuse cette fontaine ! Merci ! What a marvellous 'front door', and thanks to the info you provide one gets an idea of the size and the dimensions. I like the perspective, with the skyscrapers in the distance, and the monochrome presentation! Quelle fontaine et vue avec ces building merveilleux. That is a spectacular fountain. It is so big! Great information. A gorgeous capture of the fountain in this pretty setting. Super B&W. Superbe noir et blanc, un cadrage bien mené avec les buildings qui ressortent bien en arrière plan bravo ! Very good capture and excellent monochrome of this emblematic place. such beautiful frame, graphics & lights! Very nice this B/W : bravo. Have a lovely end of week, Steven. grandiosa immagine di una fontana davvero grande! Fine composition and perspective with the city in the background. Superb contrast. Superbe N&B ! Grande douceur des tons gris ! This fountain it's so majestic. It's a beautiful front door of the city. But if this is the front door, what is the back door? A beautiful image in a timeless rendition.